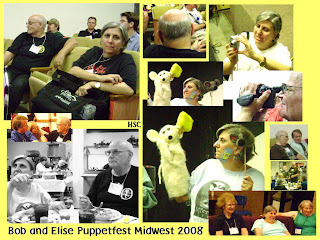 Here's the real duo in action at PuppetFest Midwest. Bob was in Luman Coad's scriptwriting class with me, and I also hung-out and laughed with Elise whenever possible! Somehow, I never got in a picture with them......When Elise sends me one of us in front of the Wild Onion Cafe, I'll post it. Are those SpongeBob bandaids on Elise's face? What happened, did she lose control of her hand wands?